The Batoidea family is closely related to the shark family and includes rays, skates, guitarfish and sawfish. Like sharks, their skeletons are composed entirely of light, supple cartilage rather than bone. They are typically flattish in shape and are generically referred to ‘flat sharks’. There are over 550 batoid species altogether. Most batoids are bottom feeders, digging up shrimps and crustaceans from the ocean floor. This helps to oxygenate the sediment and maintain a healthy ecosystem. Skates usually live deep below the ocean’s surface, at depths of up to 3000 metres. The Flapper Skate is the largest skate species, reaching lengths of almost 3 metres. The guitarfish has a bizarrely shaped head that resembles a guitar. Researchers believe that the world’s most critically endangered fish is the sawfish. This fish is extinct in 21 countries where it previously existed. 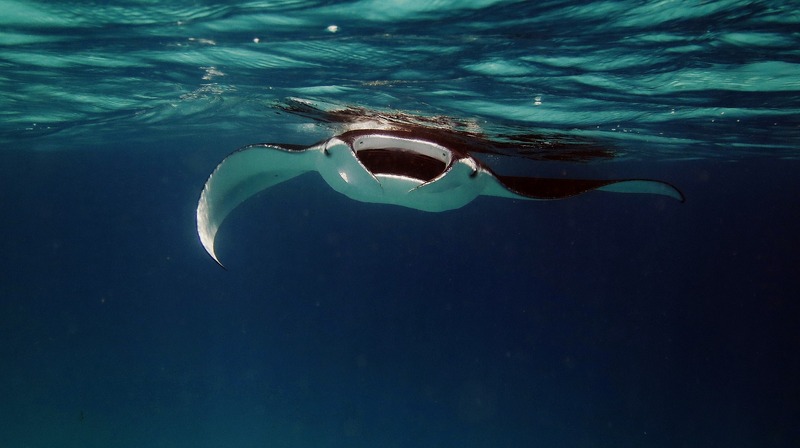 Manta and Mobula Rays are the exception to the batoid ‘bottom-dweller’ rule. They swim in the open ocean and feed primarily on plankton, which they filter through modified gills. These are slot-like openings on the throat lined with feathery plates. They have become popular in the Chinese medicine trade, racking up a market value of roughly US$11 million annually. Manta and Mobula Rays must swim forward continuously to keep water moving over their gills, ensuring their supply of oxygen. Therefore, they have developed a sleep pattern that allows them to continue moving in slow, circular motions while shutting off other parts of the brain. These rays have long, thin fins located on either side of the head that are usually retracted. The rays unfurl them when they hit a patch of plankton and use them to funnel the microscopic prey into their mouths. These cephalic (cranial) projections resemble horns when protracted, earning these rays the nickname ‘devil rays’. 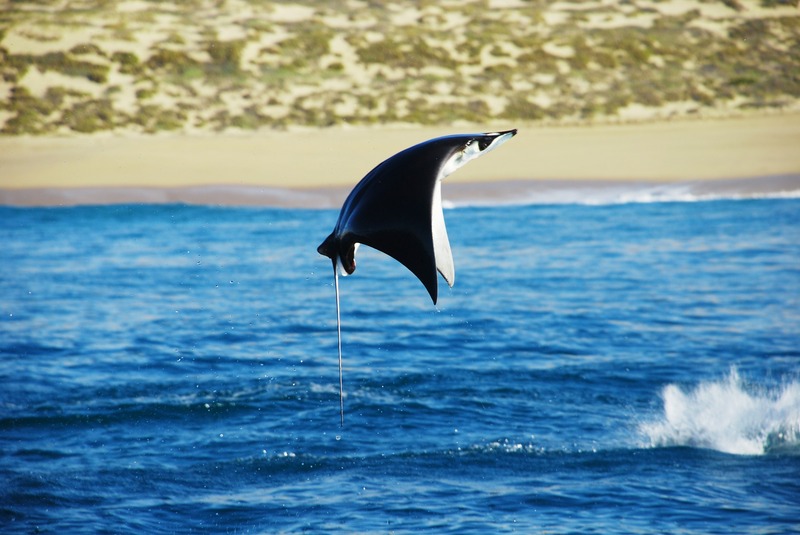 Manta Rays are the largest rays in the world, with a wing span that can reach up to 9 metres. They tend to attract skin and gill parasites, and due to this regularly visit ‘cleaning stations’ where smaller fish species (‘cleaners’) remove these in a perfect example of symbiosis. Current research indicates that Mantas are extremely slow to reach sexual maturity – that this can take 10 to 15 years. They give birth to live young (usually one pup but occasionally two) that arrive rolled up like enchiladas. They unfurl to reveal miniature replicas of their parents, with a wing span of approximately 1.5 to 2 metres. The baby Mantas are independent from birth, sourcing food and fending for themselves. Mobula Rays usually travel in small groups. Occasionally, however, they defy their usual habits and congregate in massive groups of up to 200 individuals. During these mass meetings, they tend to exhibit an unusual behaviour – one that still baffles scientists. In an exquisite aeronautic display they leap high out of the water and soar through the air, before crashing spectacularly back below the surface. Experts are not clear why they do this. They believe it may be a mating ritual or a form of intragroup communication. 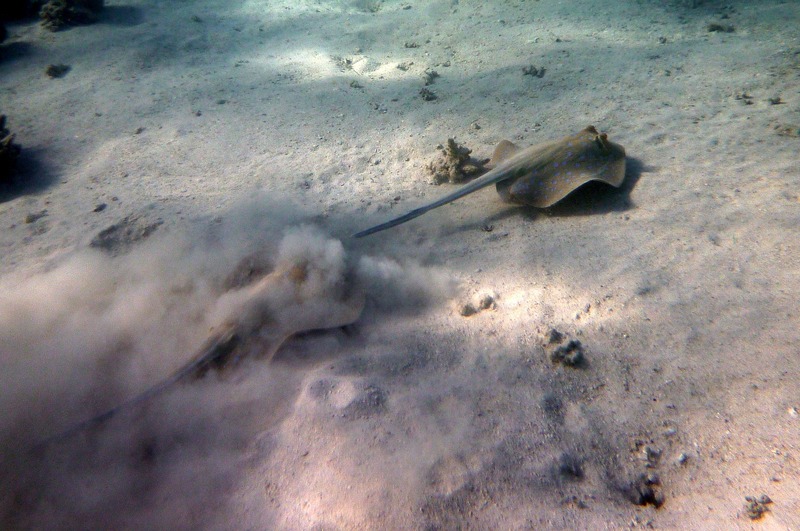 Most rays make use of barbed or toxic spines or to defend themselves. Some use their ‘stings’ to emit electrical pulses that can render prey or attackers immobilised, stunned or dead. Atlantic Torpedo Rays are able to produce as much as 220 volts of energy at a time! The Ancient Greeks electric rays to sting patients before operations or during childbirth as a substitute for anaesthesia. Skates do not use poison to defend themselves, but rather rely on thorny protrusions on their back and tail for protection. 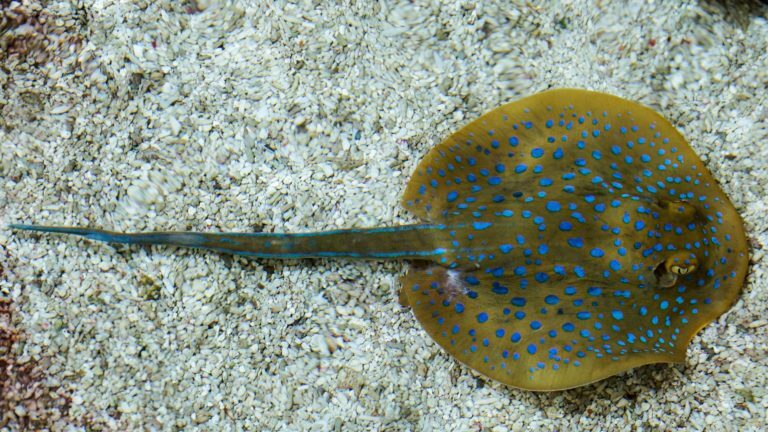 Like Electric Stingrays, they have two electrical organs near the base of the tail. These electrical impulses are too weak to kill prey or defend skates from predators. Researchers believe that rays probably use the signals to attract a mate.